We’re here, in Portland, Oregon! The vegan food capital of the world! Oh Little T, I hope you are ready for the food adventures we are going to have today. The sad news is: I didn’t bring my fancy camera. It was too much to bring. Traveling with a baby requires so much stuff! Big T and I used to pride ourselves on traveling with nothing but a backpack. We must have stared at our luggage in the living room for about 30 minutes while we tried to see if we could leave anything out. Nope, we had to take the baby stroller, the pack in play, the car seat, and the other things that go along with a baby. How can one little person need so many things? We went to Trader Joe’s to get some last minute snacks, and the lady gave Little T a spoon of vegan cookie flavored peanut butter. Five minutes later, he had peanut butter all over his face and was still holding the spoon and saying “thank you” as we got in the car and drove away from the store. Little T and I were waiting for Big T to meet us in the airport lobby. I was having a hard time juggling the bags, the baby stroller, and the baby. A really nice girl stopped and looked and me and said, “are you alone? Do you need help?” A random black man happened to walk in the door at that moment and she looked at me and Little T and said, “oh, you’re with him” and walked off. Little T’s love of restaurants runs deep. He decided to walk up to every restaurant in the airport and try to convince us to buy him more food. This was while he already had food in his hand. Every time he’d see a kid that was the same age as my two nephews, he’d chase after them screaming and laughing. This was fun for Little T, but slightly frightening for the little kids. 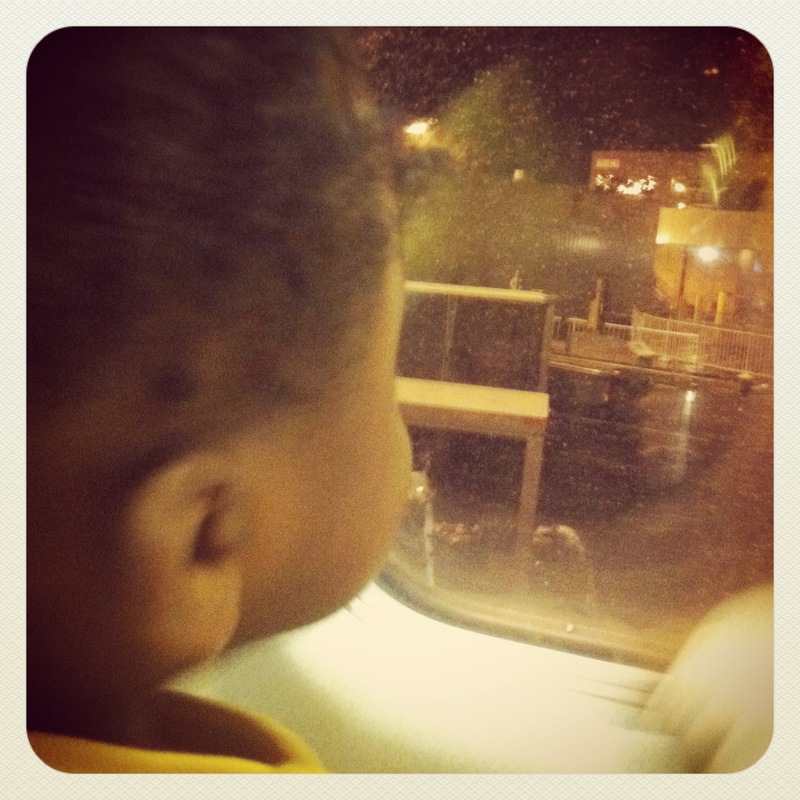 Little T was great on the plane and loved the trip. We were worried beause he’s older now and loves to shout, but he did fine. When we got to our hotel, he kept running up to these two random women and pointing at things he wanted to show them while shouting, “look!” The hotel receptionist was also vegan, and helped us start out the trip right by ordering a vegan pizza that was delivered to our room. Little T and I fell asleep before the pizza arrived, but Big T told me it was delicious. Have fun! Portland is pretty awesome. Give me a shout if you ever venture any farther north into Seattle. It would be great to see you and meet your family!